Just like any other business, auto retail relies heavily on the relationship with a customer. As we explored in our previous article, auto dealerships often scare off customers with a tiresome vehicle-purchase process. According to AutoTrader’s research, it takes buyer an average of 2.38 hours to close the deal. As a result, more and more people look at alternatives such as public transportations and ridesharing services. What can auto dealerships do to make a car-purchase and the research prior to it faster and more comfortable for customers? As the industry morphs and technology becomes more widespread for business-customer relationships, digital customer experiences and technological solutions can help remove these hindrances. In this article, we’ll focus on why digital transformation and digital in-store experiences are a strategic priority for the automotive industry. According to a report by Placed, 81% of auto shoppers use smartphones to do research when purchasing a vehicle, including 63% who used their smartphone while physically at an automotive dealership. A survey conducted by AutoTrader has identified that 42% of car shoppers use more than one device to research their new vehicle. And 68% of the respondents gave a bad impression of the brand when a dealer’s mobile site doesn’t work well. Today, people are totally comfortable with technology and their handheld devices are a common tool for shopping research and a major source of information they get on the product. In this situation, retailers who rely entirely on human-to-human communication in their service may find themselves somewhat off from the race, as store associates often can’t be as sufficient at providing information as the internet can be. However, the information on the internet takes time to have it filtered out. A report by a financial advisory firm EY suggests that buyers spend 10 hours online averagely while searching the information about the vehicles they’re interested in. Auto retailers can get the upper hand over the internet and provide all information customers need not only through store associates on the sales floor but also via digital access points at the dealerships. 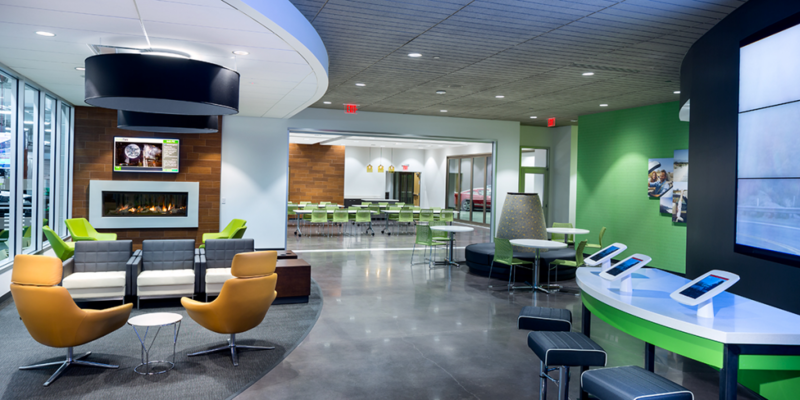 These access points can take forms of interactive digital displays, touchscreen tablets, and various self-service kiosks. There are auto retailers who are already implementing such solutions in their business. Let’s look at them. 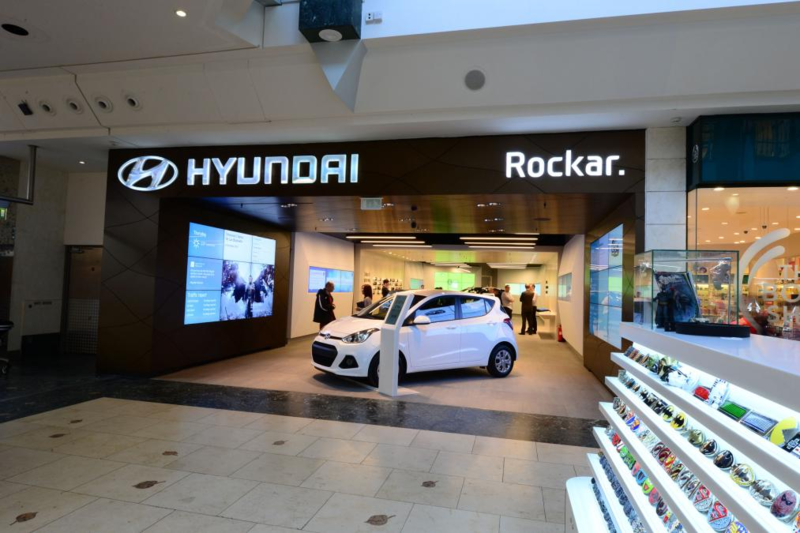 Rockar is a concept dealership operating in partnership with Hyundai. to experiment with a totally new way of purchasing cars. The idea of the store is to combine the best from both online and offline customer experiences. The store is a digital showroom featuring several models digitally, and every step of the purchasing process takes place digitally. 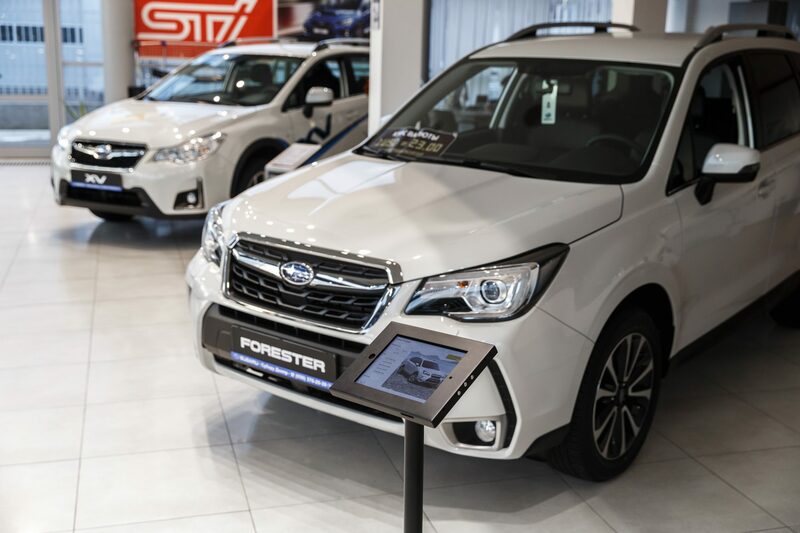 Shoppers can use touch-screen tablets in the store, their own smartphones, or leave their personal details and continue their car-buying process later online. According to Rockar, half of its sales are completed in the latter way. Store associates in the showroom help visitors use Rockar omnichannel services and provide all relevant information, however, a customer can close the deal in a digital fashion entirely. Rockar’s concept requires less physical space than an ordinary dealership and can engage more foot traffic in urban areas — somewhere their competitors are out of reach. The Audi City concept store exists since 2012 and now can be visited in London, Berlin, Paris, Istanbul, Beijing, and Moscow. Audi City is purely a brand experience. It lets visitors find out more about the latest technologies and services. 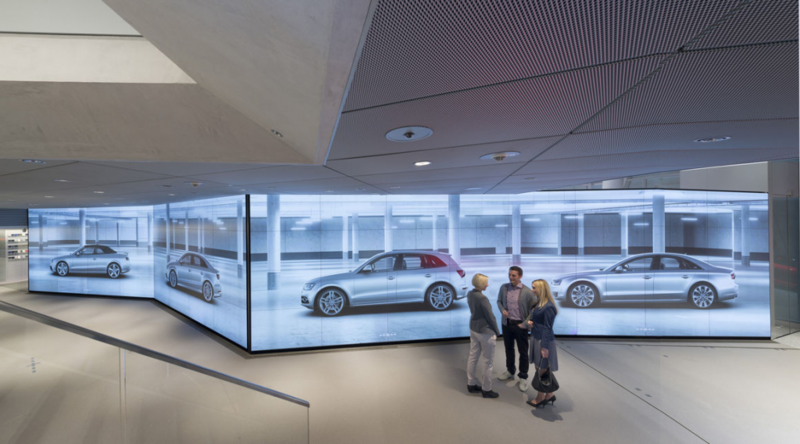 Audi City digitally presents the entire Audi model line-up, and visitors can customize their individual model view it on a 1:1 scale on ceiling-high displays, and then make an order. The experiences we talk about are true both for new and used car dealerships. EchoPark, a chain of used car dealerships in Colorado. Looking like a crossover between a tech store and a modern hotel lobby, EchoPark’s concept stores built on the idea of seamless integration of technology and personalized human-to-human interaction. The stores have both store associates, the “Experience Guides”, and tablet-based kiosks that provide detailed information on available cars. Store visitors can get full guided assistance from store associates or browse information on their own. Additionally, customers can schedule an appointment or pre-shop online and visit the store only to close the deal. EchoPark seeks to build customer-business relationships beyond car purchase. An example of this is that company offers customers use free car washes at every EchoPark location. To sum up, let’s outline the main use cases of digital technology in the auto industry. So where do car dealers and OEMs can implement digital experiences to engage customers and make buying a car a much faster and convenient process? 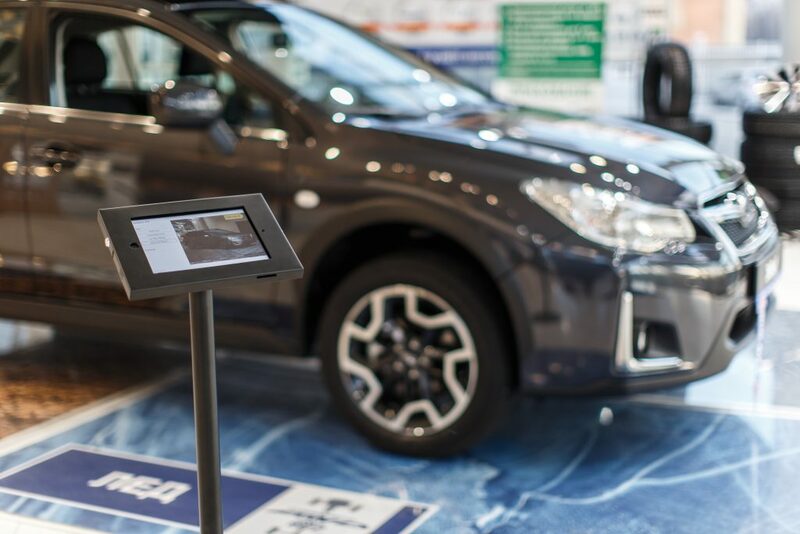 Self-service kiosks and interactive screens can be used on a sales floor for engaging customers with promotional media materials, providing them details on the vehicles, scheduling a test drive and more. Kiosks placed at specific points in a dealership can showcase auxiliary products and accessories. A customer can browse them and make additional purchases while, say, they are waiting for the paperwork to be done. Differentiating content depending on the functional role of the spot they are located in helps not to overflood customers with the information they don’t need at the time and make each part of the dealership meaningful. With such a delicate decision like buying a car, customers still need an expert personified opinion. Having handheld tablets or just using tech on the salesfloor, a salesperson can deliver and visually showcase all information a customer needs without additional research, hence shortening the time one needs to make a purchase decision. Car dealers and OEMs (original equipment manufacturers) can engage more people opening small-scale showrooms that will drive foot-traffic in shopping malls and other crowded locations where they cant afford a full-scale store with a range of models. In this case, digital transformation is the only way to appeal customers, and interactivity is what helps customer engagement. Customers can use a self-service kiosk to view models and quickly schedule a test drive without any external assistance. The purchase of a car is only the beginning of the business-customer relationships. Providing customer service is the subject as sensitive as helping a customer make a buying decision. Providing comprehensive information at the service centers on the work they do — telling about the services, showing car service case studies — all this can be done more effectively with the aid of digital assistance. As customers seek both online and offline experiences, the solution OEM’s and retailers can find to please the audiences is building up omnichannel strategies that allow customers to start their journey both online, using their smartphone, or just visiting the dealership. Whatever their input point is, it must be self-sufficient in that role and eventually lead to the closure of the deal.